The battery drain problem is main issue on every high end and low end smartphones. In last some years smartphone reaches at new heights with mind blowing features. But one field is always behind the other all smartphone features and that is battery performance which is very weak compare to specs and features. In last 5 years we seen lots of smartphones and tablets with top notch quality services, but in that all gadgets, not a single one is satisfying customers need. You choose any device the result is always poor in battery quality that you need to charge it many times in a day. Now a days many users uses smartphones to play high graphics games and to surf Internet all the day, thats why it ate too much of battery. The results were even poor on Android devices which were always power hungry due to its complex design and multitasking functions. Compare to those Tizen smartphones are less power hungry and has better battery backup in heavy usage. Every customers who bought Android device was always worried about their battery backup. The Windows Phone users and iOS iPhone users also not different than Android customers because in the somehow low or high they also faced this problem. New gadgets like Galaxy S7, Galaxy S8 & Galaxy Note 8 are launched with larger batteries, still struggling to make enough juice. Where on the other side some phones works fine with smaller batteries and some basic tricks. This problem is now changing year by year because every companies are started to improve their whole hardware and software system to make power savvy. The OS makers Android, iOS and Windows Phone are now caring more on battery side by tweaking their operating system design to save more juice on their all devices. Smartphone manufacturers are also not behind it and they also improving overall core of their all gadgets from flagship phones to budget phones. Samsung, the world’s largest smartphone manufacturer are always trying to give more to their users so how could be they behind than others. Every year they are also improvising their battery performance on all flagship to low models, that’s why we seen much improvement on their main series like their Samsung Galaxy S3 device was much improved in battery back up than Galaxy S2 and even better results is in their Samsung Galaxy Note 5 than Note 4 and Galaxy S6 series phones. Even the battery on Samsung Z2 is far better than first generation Samsung Z1 device. Now with the Galaxy S5 they introduced new feature which can save even more juice. The new feature is Ultra Power Saving Mode the good and perfect solution which can run your device more than you think. Samsung said that in the 10% charging you can use it 24 hours. It is best idea and if you also bought one Samsung device then you must know this feature. 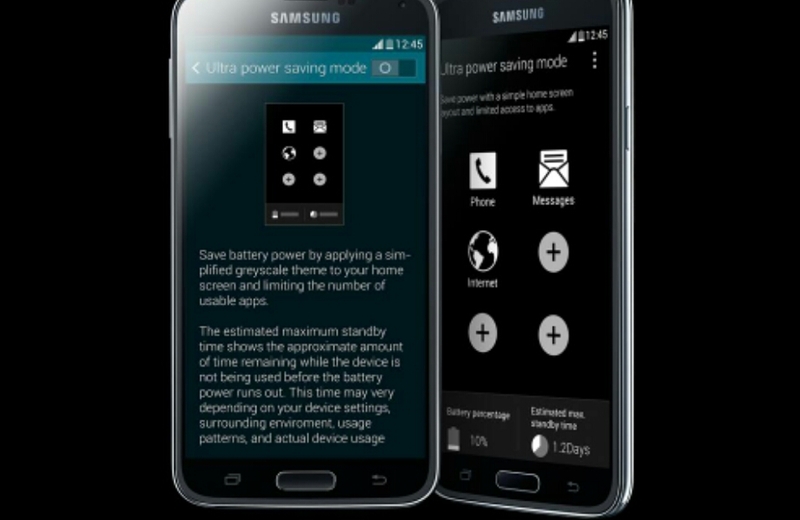 If you never used this before then in this article I will guide you how to use Ultra Power Saving Mode on Samsung smartphones including Tizen. To use it follow these simple steps. 1) Ultra Power Saving Mode is inbuilt feature on Samsung devices so first go into the Settings. 2) Then click on Ultra Power Saving Mode feature to open it. 3) Tap on the slider to start it, because by default it is turn off so manually you must start it. 4) You are using it first time so firstly agree their terms and conditions. Click on the Agree button and then tap Ok button. 5) Now you can use this feature. Here you can use any six apps from your mobile and by defaults Phone, Messages and Internet browser are open. So choose remaining 3 apps from your phone which are most important to you. That’s it now you can save much more battery from your cellphone without hurting it’s performance. When you start this feature after that your screen will goes in black and white colors to save most percentage so use it in emergency. After some times if you want to stop this function then click on More option which is present on right side of your screen. Here tap on Turn Off Ultra Power Saving Mode and then click on Turn Off. After this your screen will goes in normal mode and again you can use it as per your need. Samsung said this is still in beta phase and there is still more rooms for development. But as per my experience it is one of the best battery saver features available in the market. The all Tizen smartphones new Samsung Z4, Samsung Z2, Z3 And Samsung Z1 has great battery back up than any other devices, but still it is better to take care of our remaining percentage of battery. Who knows we need much more juice when we roam outside. In the emergency this feature could become very useful that you must need it to save your battery from unwanted usage. What Is Gorilla Glass 6? How It Protects Smartphone Screen?